It seems like everyone is in a hurry these days. Between work, caring for children and trying to have somewhat of a social life, many of us find it hard to squeeze in time for ourselves. Treating your skin doesn’t have to take a long amount of time. As long as you use the right products, techniques, and are consistent, you should be able to see the benefits of your efforts in no time. The first thing of proper skincare is using an appropriate cleanser for your face according to your skin type. For example, if you have dry skin, never use a cleanser for oily skin. Doing so will strip the little oils that are there and increase the dryness. The same thing goes for oily skin, Never use dry skin cleansers on oily skin. It will only make the skin feel more greasy and will most likely cause breakouts. Clean the skin in the morning and before bed to wash away any dirt and debris that has accumulated. A battery operated cleansing brush paired with your favorite cleanser works well to exfoliate dead skin cells and leave a radiant glow. An important step, that is often skipped, is using a toner. Toners are an excellent means for balancing the skin’s pH after cleansing. When the pH is balanced, the skin is happy and there is less chance for inflammation. Toning also hydrates the skin, which is very important after cleansing. Each toner has different ingredients and benefits. Do your research on which one is right for your specific needs. If you want to eliminate a step in your daily skin care routine, choose a moisturizer for you skin type that also has a sunscreen added for daytime use. Protecting your skin from the damaging rays of the sun, will prevent loss of collagen and elasticity, which reduces the formation of wrinkles. Your night time ritual should also include a moisturizer after your face is cleansed and toned. Night creams are generally heavier and tend to hydrate more than day creams. They also often contain acids or Retinol to help smooth skin and dissolve fine lines. Incorporating an eye cream into your regimen is a quick way to reduce and prevent crows feet. You will find a number of different eye creams and serums on the market that serve different purposes. There are creams that help eliminate dark circles and puffiness that are good for the morning. Others are geared more for night time use and are used for hydrating the fragile skin around the eye. Now that you have developed a step by step plan of action, all you need to do is put it in motion. Create a habit by caring for your skin at the same time every day. Keep all of your products in a convenient location so you can access them easily. Always be mindful to remove any makeup before you go to bed and moisturize in the morning and night and wear a good sunscreen when going outdoors. Once you develop the habit, you won’t even think about working skincare into your schedule, it will just be a part of your daily life. For further reading on how to care for your skin and look younger, check out: 3 Ways To Get Rid Of Undereye Wrinkles At Home and The Right And Wrong Way To Apply Foundation To Your Face. You know the feeling… When you look at yourself in the mirror one day and suddenly you notice that your skin has started sagging. It may not appear as tight and firm as you thought it was. This moment can be a real shock and it happens to everyone, sooner or later. Your first line of defense is to replenish the skin to tighten it up again, Many of the products on the market that do this are extremely overpriced and can really put a dent in your budget. Don’t let this discourage you. You can easily obtain the same results as the expensive products by using easy home recipes for your skin. The ingredients are most likely in your pantry right now. This mask works well, because the egg whites tighten the skin, as well as the yogurt. The sugar helps exfoliate dead skin cells. Apply this mask once a week for best results. Separate the egg yolk and the egg white. Combine the yogurt with the yogurt and sugar with a whisk or fork until well mixed. Apply to the face in smooth upward strokes with a fan brush and let dry. For extra lift, lay with your head off the edge of the bed while it is drying. Once the mask is completely dry and your face feels tight, gently remove it with warm water and a soft washcloth. It’s like getting a mini, non-surgical facelift! 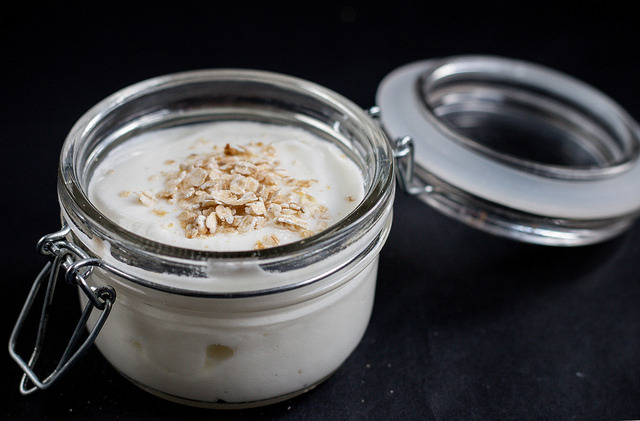 Yogurt contains an array of vitamins and minerals that are beneficial to the skin. These nutrients, such as: lactic acid, calcium, zinc, alpha hydroxy acids and vitamins B2, B5 and B12 can be absorbed into the skin. 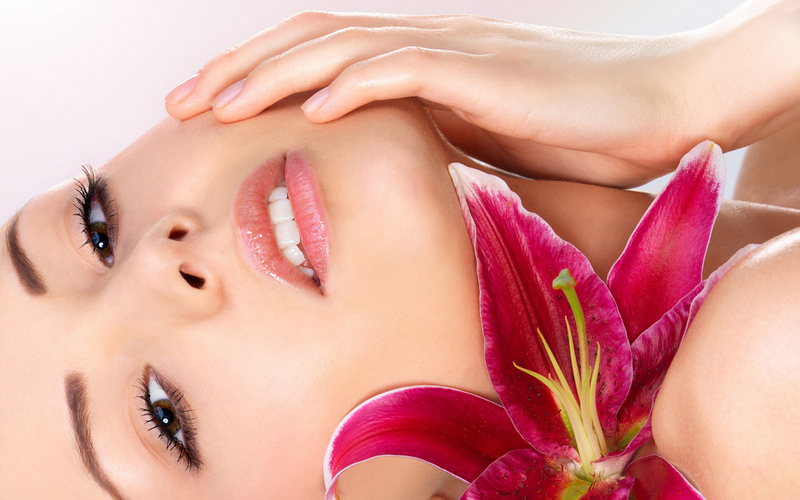 If your skin is healthy, it will feel firmer and appear more vibrant. Oatmeal is excellent for all skin types, ranging from sensitive, dry and oily. It is a great soothing agent and also works well as an exfoliator and for closing large pores. Honey is a wonderful antioxidant and will also give the skin a youthful glow. It is also beneficial for treating acne, due to its antimicrobial properties. Combine yogurt and oatmeal in a bowl and let sit for several minutes to soften the oatmeal. Once the oatmeal has absorbed some of the yogurt, stir in the honey until well mixed. Apply the mask evenly across the face and neck with your fingers and allow to dry for about fifteen minutes. Gently remove the mask with warm water and a soft washcloth. If you have dry skin, this is the mask for you! The natural oils in the avocado will soften, moisturize and plump your skin, creating a more youthful appearance. The olive oil will also help your skin feel deeply hydrated and smooth. Smash the avocado in a bowl until smooth, stir in yogurt, olive oil and honey until well mixed. Apply evenly to the face with your fingers and let sit for 15-20 minutes. Gently remove with warm water and a soft washcloth. Now that you have some easy recipes at your fingertips, you can start using them to firm up your skin and slow down the signs of aging. The money you save from not investing in store bought products can be put to better use. Don’t forget that incorporating facial exercise into your daily routine is another method of combating signs of aging. You can read more about it here: 10 Minute Facial Exercise That Will Help You Look Younger and How To Get That Non Surgical Face Lift Without Using Product. Having a regular skin care routine is more than just a surface-level concern. No matter what your age is, having a skin care routine will help keep your skin healthy, making you look and feel good all throughout the year. Skin care routine may sound too high maintenance but the truth is, it’s very easy to implement even for complete newbies. Below is a skin care routine guide for beginners. The first step in establishing a skin care routine is knowing your skin type. The most common skin types are normal, oily, dry, combination, and sensitive skin. A normal skin type is characterized by good blood circulation on the skin. People with normal skin type usually have smooth, soft, and even skin tone. An oily skin type is characterized by overactive sebaceous glands. Hence, people who have oily skin tend to produce more oil than necessary, making them more prone to having enlarged pores and acne flare-ups. A dry skin type is the opposite of the oily skin. People with a dry skin has a low level of sebum, making the skin flakier and feels tight after being wiped with a tissue. A combination skin type is characterized by dry or normal skin in some areas and oily in others. The oily area is usually the T-zone (forehead, nose, and chin). Sensitive skin is a term used to describe a skin condition in people who break out easily. People with sensitive skin type can easily get itchy, blotchy, or stinging skin after using certain products or exposed to certain weather conditions. A cleanser is a product you use for washing your face. It is important to choose a cleanser that’s suitable for your skin type and one that’s meant for washing your face. The usual bar or body wash can have harsh ingredients that can easily strip off your skin’s moisture.Finding the right cleanser can be tricky as it’s usually a trial and error process. If you have dry skin, a fragrance or alcohol-free type can be a good option. If you have an oily skin, opting for an oil-free type can be your best bet. After you wash your face, you will need a toner to smoothen, soften, and calm your skin. A toner can provide a ‘clean’ feel for those with oily or combination skin type.A good toner contains ingredients that help restore nutrients to the skin. It can also help in reducing dry patches or redness. Regardless of your skin type, you’ll need a moisturizer to hydrate your skin. It can keep your skin smooth and healthy-looking. UV exposure doesn’t just cause skin cancer; it’s also the leading cause of wrinkles and other signs of skin aging.Using a broad-spectrum sunscreen with SPF of at least 30 can help protect your skin from the damaging effects of the sun. Sunscreen should be applied everyday even when it’s gray or cold outside. Exfoliating products are not meant to be used every day but they can be useful for certain skin types such as weather-induced dry skin. Using it once or twice a week after a cleanser and before applying the moisturizer can help in getting rid of dead skin cells. When used correctly, they can help clear the pores, giving you smoother and younger-looking skin. As a beginner, the list of skin care items to use may sound too overwhelming. A good way to remember what items to use at certain times of the day is this: morning routine should be about protection and prevention while night time routine should focus on cleansing and repair. You can begin your morning routine by rinsing your face with warm water and then applying moisturizer and sunscreen. At night, a more dedicated skin care routine is needed. It involves cleansing the face with a product suitable for your skin type, getting rid of the makeup and dirt using a toner, exfoliating if there’s a need to, and then capping off the routine with the use of a moisturizer. As the largest organ of the body and the first line of health defense, your skin needs to be taken good care of. Whether you’re in your 20s or 40s, this skin care guide can get you to your goal of having healthy, smooth, and young-looking skin. Everyday the skin is exposed to bacteria, virus, dirt, oil, and other pollutants. Regular skin cleansing helps get rid of these skin-damaging elements, keeping your skin clean and fresh-looking. Skin cleansing doesn’t just pertain to washing the face; it also means keeping the skin hydrated through the use of a good moisturizer. Keeping the skin hydrated is very important especially that as you age, you begin to lose your collagen and your level of estrogen starts to drop. Both collagen and estrogen plays an important role in keeping your skin supple and well-hydrated. Beneath the skin are tiny glands that produce oil called sebum. The oil reaches the outer layer of the skin through the hair follicles found within the skin. Dirt and other pollutants can build up on this outer layer, trapping the sebum, sweat, and dead skin cells. This eventually leads to inflammation and the development of acne. Proper and regular washing of the skin prevents this buildup. Hence, making skin cleansing a habit can help keep your skin free from blemishes. Research shows that certain physiologic changes happen on your skin overnight and it needs oxygen to repair itself. It could not do the necessary repair if it’s clogged with dirt, bacteria, and even with your makeup. Through regular skin cleansing, you can get rid of these pollutants and other harmful elements that keep your skin from repairing itself. Anti-aging and hydrating creams are also better absorbed when the skin is clean. Using a good skin cleanser can help emulsify the dirt, dead skin cells, excess sebum, and other pollutants sitting on your skin. When these elements are not removed, they can seep down on your skin and clog your pores. This can be a problem as you age as your pores will no longer snap back as easily as before. A good skincare regimen begins in choosing the right skincare products for your skin type. So before anything else, know your skin type and choose products that suit it well. Warm water has the right temperature to get rid of the dirt without over drying your skin. You can use cream or gel cleanser to emulsify the dirt, excess oil, and dead skin cells on your face. You may also use makeup remover if you’re wearing makeup. Once you’re done, pat and do not rub your face with a towel. Rubbing the skin with a towel can irritate it and cause wrinkles. Get a cotton ball, put some toner, and swipe it around your face especially on your problem areas. If you have oily skin, swiping the toner on your T-zone helps in getting rid of excess oil. Applying a pump or two of serum all over your face is enough to keep it fresh and young-looking. Serums can do more than hydration; it can also address other skin issues like redness and skin aging. You may use your serum together with a moisturizer. You can opt for one with SPF in the morning and a heavier cream at night. The skin surrounding your eyes is the thinnest. It’s also where the signs of aging start to appear. 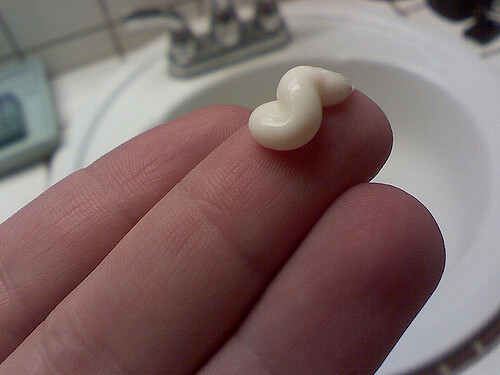 So, don’t forget to dab a pea-sized of eye cream under your eyes. If you’re applying makeup, wait for a few seconds for the cream to be absorbed before putting on your makeup. It’s possible to keep a young-looking and blemish-free skin. We just need to develop some good habits like eating right, sleeping well, and having a regular routine of proper skin cleansing like the one outlined above. Try it starting today and notice the difference it makes on your skin.